Creamy delicious mashed potatoes with homemade gravy in one pot? You bet and these are delicious! If you love the creamy goodness of mashed potatoes but hate all the work and clean up, you'll love these potatoes! 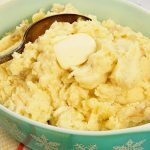 Pressure Cooker Mashed Potatoes with Homemade Gravy are the easiest and most delicious way to make yummy creamy potatoes that you will absolutely love! Scrub and clean the potatoes well. Cut large potatoes into three pieces and add the potatoes to the pressure cooker. Add the stock. Secure the lid of the pressure cooker. Press the steam setting and set the timer to 12 minutes. While the potatoes are cooking mash together 2 tablespoon butter and 2 tablespoons flour. Make sure it's completely creamy - no lumps! When the timer goes off, remove the potatoes, strain and save the liquid. Warm the milk/cream and butter mixture slightly. Just enough to get the butter to melt and the dairy warmed up. Mash the potatoes, seasoning with butter and warmed cream. Salt and pepper to taste. Return the liquid to the pressure cooker. Change setting to sauté. When the liquid is boiling, quickly whisk in the butter/flour mixture. Whisk together until the liquid begins to thicken and continue cooking for about three minutes. Whisking frequently. Taste and adjust seasoning. Serve and enjoy!